Workers walk past an electric taxi at The London Taxi Company's new facility near Coventry, England. FRANKFURT -- The London Electric Vehicle Company (LEVC), owned by China's Geely Group, hopes Brexit negotiations will not jeopardize plans to export half of the black cabs made in England by 2020, CEO Chris Gubbey told Reuters. "By 2020 we want 50 percent of our manufactured goods to be exported," Gubbey said in an interview. 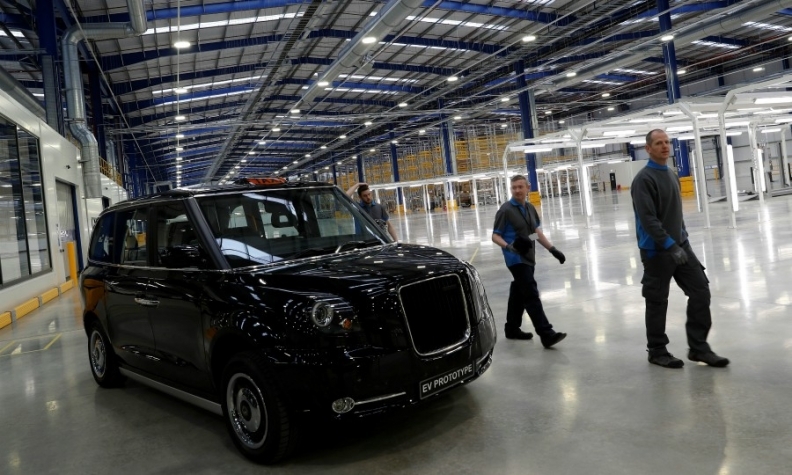 LEVC, formerly known as London Taxi Company, opened a new factory in Coventry, central England, in March to produce electric black cabs with the aim of producing about 10,000 vehicles for British and overseas markets. "We're very keen to see the negotiations proceed in the direction of maintaining the current situation, without additional tariffs," Gubbey said about efforts between Britain and the European Union to negotiate an amicable separation. "I don't think anybody has a truly effective Plan B." The company's business plan depends on maintaining a free flow of goods between its factory in England and other parts of the Geely Group, which includes Volvo Car Group. "The ability to share the technology from Volvo and its supply base is a big enabler," Gubbey said. LEVC depends on free trade to keep importing vehicle parts to its UK factory from other markets. "We get approximately a third of components from the UK, a third from the rest of Europe, and about a third from Asia," Gubbey said, adding that cabs will use components from other Geely group vehicles. German engineering company Siemens provides the electric motors, and German auto supplier ZF Friedrichshafen supplies generators. Some parts come from sister company Volvo and batteries are provided by LG Chem, Gubbey said. "We have a higher European content than with the current vehicle," Gubbey added. Starting in January 2018, all new cabs in London have to be zero-emissions capable, meaning they cannot be diesel and must be either fully electric or plug-in hybrid, according to rules introduced by the mayor of London.